Relics of Ireland's ancient past have been uncovered - thanks to the recent heatwave and drought. Images captured by a drone show a previously undiscovered monument or henge close to the 5,000 year old Newgrange monument in County Meath. Measuring up to 200m in diameter, it is believed to be a late Neolithic or early Bronze Age enclosure. "The weather is 95% responsible for this find," said Anthony Murphy who found the site along with Ken Williams. "The flying of the drone, knowledge of the area, and fluke make up the rest in this discovery," he said. "There's more moisture in the field where the features of this site are and that's why the grass is greener. "So it shows up nicely against the more yellow grass around it." A complex of monuments in the nearby area were built along the River Boyne and are collectively known as Brú na Bóinne. "I had an inkling that something was there," Mr Murphy added. 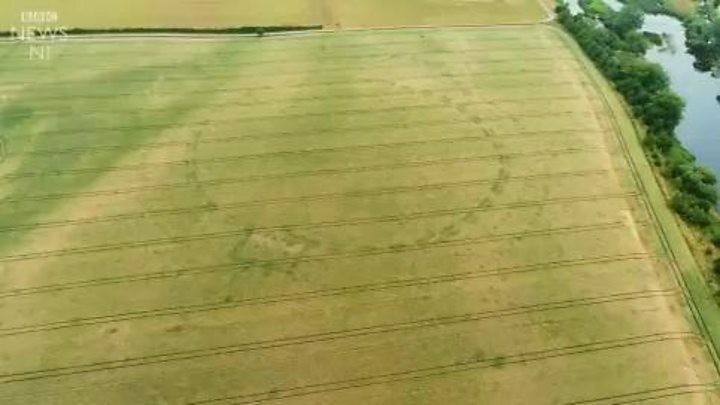 "We were flying the drone around the Boyne Valley when we saw what appeared to be a circular site. "We flew a bit closer and we immediately knew that something important had been found. I was completely flabbergasted. "We know the landscape fairly well and know where the known sites are. "We knew this was not recorded." The discovery has been reported to Ireland's National Monument Service which holds details of almost 140,000 monuments. "This is internationally significant and we now need to figure out what it means," said Steve Davis, an archaeologist at the University College Dublin. "It's one of a series of large monuments near Newgrange. We don't know what the henges are for but it's thought they were meeting places. "The confusing thing is why there are so many in one area. "Nowhere else in the world has so many in one spot." The monument is on private land and there are no plans to excavate it at the minute. 'Sun standing still': Why do we celebrate the solstice?